인왕산 기슭에 위치한 국사당은 무속신앙에서 섬기는 여러 신을 모신 당집으로 요란한 굿판을 벌이기 쉽도록 인가에서 멀리 떨어진 산 속에 세운 ‘굿당’에 속한다. 원래 남산 꼭대기에 있었던 것을 일본인들이 남산에 조선신궁(朝鮮神宮)을 지으면서 이전을 강요하자 건물을 해제하여 현재의 인왕산 기슭에 옮겨 원형대로 복원한 것이다. 인왕산을 택한 이유는 이곳이 풍수지리설에서 명당에 속하고 현재 무속신으로 모셔지는 조선 태조와 무학대사가 기도하던 자리이기 때문이다. 앞면 3칸·옆면 2칸이고 양끝의 2칸은 이곳으로 이전한 후 새로 지은 것이다. 1칸은 4쪽의 여닫이문으로 되어 있고 지붕은 옆에서 볼 때 사람 인(人)자 모양인 맞배지붕이다. 내부의 3면에는 무신도가 걸려있고 마루에는 제상을 차리고 굿을 하는 공간으로 이루어져 있다. 일반 건물보다 구조는 간단한 편이나 그 규모는 더 크다. 1925년경에 새로 지어진 국사당은 영·정조때의 건축기법을 바탕으로 한 원래의 국사당을 그대로 복원한 것이다. 내부의 대들보가 아치형으로 된 것이 특이한 이 건물은 전체적으로 구조가 간결하면서도 목재의 짜임새가 튼튼한 것이 목공의 솜씨가 돋보인다. 인왕산 국사당은 다른 당집에 비해 건물이 견고하고 많은 무신도를 볼 수 있다. 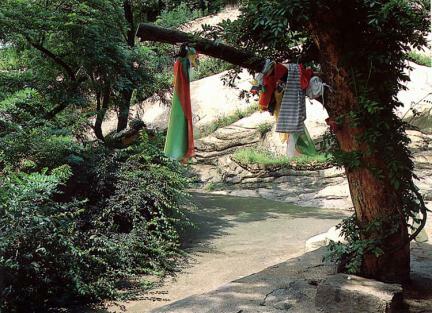 Guksadang Shrine, at the foothills of Inwangsan Mountain is a Dang-house (house for rites) dedicated to shamanist gods. Like many other Gutdang, (a house for a gut – a shaman ceremony), it is built in remote mountains, so that the noise of gut ceremonies would not disturb residential areas. Guksadang was originally built at the top of Namsan Mountain, but was dismantled and removed to its present location by order of Japanese imperial regime, which built Joseon Shrine on the original site. 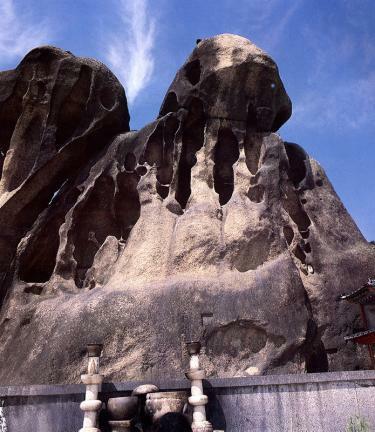 Inwangsan Mountain was chosen was because it was considered a propitious site according to feng shui principles, and it was also a place where King Taejo of the Joseon Dynasty and his advisor, the Buddhist monk Muhak, both of whom were later celebrated as shamanist gods, had prayed. In Korean architecture, the space between two pillars or columns in a building is called one kan, and each kan has four doors. Guksadang Shrine has 3 kan at the front and 2 kan at the sides. After the restoration, 2 kan at both sides were added. The building has a gable roof with '人'-shaped sides. Inside, paintings of shamanist gods are hung on all three walls and the floor space is divided for setting up a ritual-table and performing a gut. The building itself was built in a much simpler style but on a larger scale than regular traditional houses. 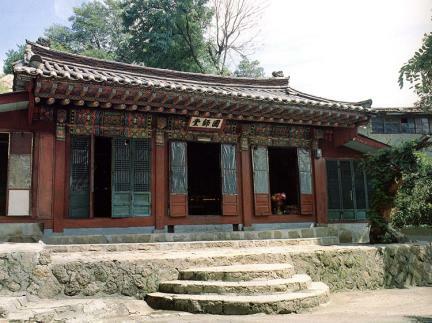 Guksadang was rebuilt in 1925 following the original construction method which was used during the reigns of King Yeongjo and King Jeongjo. Its simple yet sturdy structure and master-hand carpentry are remarkable, particularly the unique arch-shaped crossbeams. 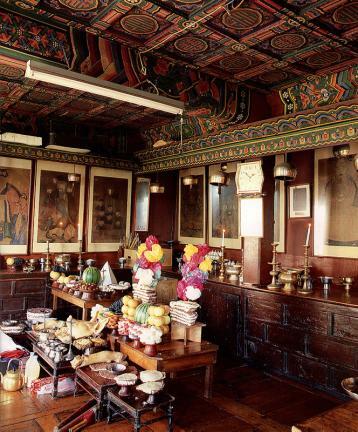 Compared to other dang houses, Guksadang is sturdily built, and it has many shaman paintings.